The Majestic Line gets its name from the "Tales of Para Handy" by Neil Munro, about the "puffers" that sailed the Western Isles in the 1930s. They narrate the amusing exploits of their crews and in one chapter the engineer claimed to have found work on the fictitious Majestic Line, whose ships, he said had "gold funnels". Glen Massan, Glen Tarsan and Glen Etive have gold-painted funnels, and Glen Shiel will also feature the fleet's trademark gold funnel and blue hull. Majestic Line cruises are designed to reveal the hidden beauty of the sheltered lochs and islands of Argyll and the Hebrides, which are often undiscovered by visitors to the area, but well known to company's founders, who live and sail there. The Majestic Line has helped establish a vibrant small-ship cruising sector in the region, and it is the only company in Scotland with a fleet of three vessels with ensuite accommodation. Each cruise provides passengers with the opportunity to visit places that are inaccessible to larger cruise ships, with itineraries around Argyle's coastline, the Inner Hebrides and the Western Isles. Glen Massan and Glen Tarsan undertake three- and six-night sailings to the Inner Hebrides and Argyll; Glen Etive offers 10-day voyages to Islay, Skye, the Outer Hebrides as well as the remote island of St Kilda. All three boats sail from the port of Oban on Scotland's Argyll coast and the season runs from early April to late October. Glen Shiel will offer 10-night cruises to the west coast of the Outer Hebrides, St Kilda and rugged and isolated Wester Ross. The line found fame in 2017 when it was featured on the first series of the Channel 5 show "Cruising with Jane McDonald", when the popular former cruise show singer turned TV personality took a cruise on the Glen Tarsan. There's a truly Scottish flavour to this family-and-friends-run company, which won the Tourism Entrepreneur of the Year category in the 2012 Highlands and Islands Tourism Awards. 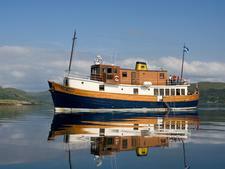 These classic vessels are the sailing equivalent of lovingly restored steam trains. The decor is country house style and offers a truly relaxing experience, so don't expect top-notch luxury or lavish suites. The crew of four will do almost anything to go the extra mile to make every passenger's holiday memorable –- such as taking the tender to fetch the morning newspapers. Glen Massan and Glen Tarsan have a similar layout and carry a maximum of 11 passengers; Glen Etive has a maximum of 12 guests. Each cabin has a small shower room with a toilet and washbasin. A small number of cabins are reserved for single occupancy at no supplement. Most of the time passengers are off the boat walking in beautiful countryside, visiting quirky villages or exploring castles and the Gulf stream-warmed gardens the area is famous for. The rest of the time they are on deck watching for passing porpoises and birds or swapping stories with fellow passengers, reading or eating. The cuisine makes good use of the fresh produce that is often brought aboard daily and reflects the very best of Scotland's larder. The chef ensures menus are well-balanced and dinner is an undisputed highlight of each day. Good quality wine is complimentary at evening meals, and there's a reasonably priced bar for pre-dinner drinks (including the Majestic Line's own Bilgewater Gin) and nightcaps from the array of top-notch single malt whiskies. Most passengers are British, and above 40, with an interest in the countryside and wildlife. Children aged under 12 are not allowed onboard, except for a whole ship group charter. Australians, Canadians and Americans are well represented, as are any English-speaking travellers with an interest in Scottish heritage and the unique beauty of Scotland's west coast. Many of the passengers have previously sailed on Star Clippers' vessels, joined expedition-style itineraries sailing to remote destinations in Alaska, or have owned or sailed yachts. A Majestic Line cruise is not a glitzy experience but is ideal for passengers who prefer their cruises to be experiential rather than predictable, sociable rather than rowdy. 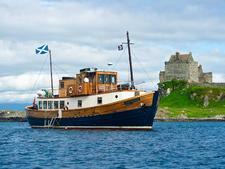 The Scottish small-ship cruising specialist operates a fleet of three -- soon to be four -- classically styled vessels. Finished in traditional wood and brass, Glen Massan and Glen Tarsan are 85ft in length. They were originally built in Baltimore, County Cork by the Irish Government to assist the fishing industry. At separate times they were saved from the scrap-yard and acquired by two Scottish sailing enthusiasts Andy Thoms and Ken Grant. Both these wooden boats were ingeniously refurbished and entered service in 2005 and 2007 respectively. In April 2016 a third vessel was constructed at the Ardmaleish Boatbuilding Company on the Isle of Bute in Scotland. Given the name Glen Etive, this boat is also 85ft in length but more spacious internally due to the steel exterior, and accommodates 12 guests in seven double cabins. These three boats boast a painted wooden hull and deckhouse topped by a varnished wooden wheelhouse. They are tiny by the standards of most cruise ships, which is why they can go where other ships that ply Scotland's Western Isles cannot. In 2019 the fleet will expand with the addition of the Glen Shiel which is currently being constructed at the Ardmaleish boatyard. 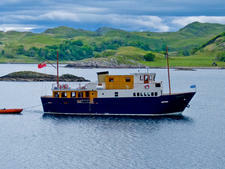 Similar to sister ship Glen Etive, it will carry a maximum of 12 passengers with space for two singles. Both ships sail from Holy Loch, near Dunoon on the River Clyde, and Lochs Fyne and Oban, which are further north. However, the itineraries are changed each year, so visit the Web site for exact details. From Loch Fyne or Holy Loch, you might sail around the Kyles of Bute, and in Loch Fyne, you might take in the towns of Tarbert and Inverary. Further south into the Firth of Clyde, you could explore the Isle of Bute, the islands of Arran and Cumbrae and Holy Isle. From Oban, there are three- and six-night itineraries around Mull, the Southern Hebrides, Skye and the Inner Hebrides, plus sheltered water cruises to Mull, Loch Ness and the Caledonian Canal. Heritage, wildlife, inlets and islands are the focus of the cruises, but all destinations depend on the weather, tides and passenger preferences. It is possible to charter the boats for private parties, and transfers can be arranged from Glasgow Airport. From November 1 until March 31 each year, Glen Massan is moored at Holy Loch and is run as a floating gourmet restaurant by cruise chef Stephen Boswell.